The man in the windowless van has a bucket of candy sitting on his back bumper, which is pretty much the exact scenario I warn my children about all the time. But this man also has a cooler full of beer, so I’m willing to overlook all of the “after school specials” I’ve seen over the years. I’ve been riding my bike for hours on a dirt road in the middle of the forest. I need a beer. I’m four hours into the New Belgium Ramble Ride when I see this van for the first time, and over the next few days, I will come to love the site of this windowless cautionary tale. The Ramble Ride is a three-day bike ride across Pisgah National Forest in the mountains of Western North Carolina. 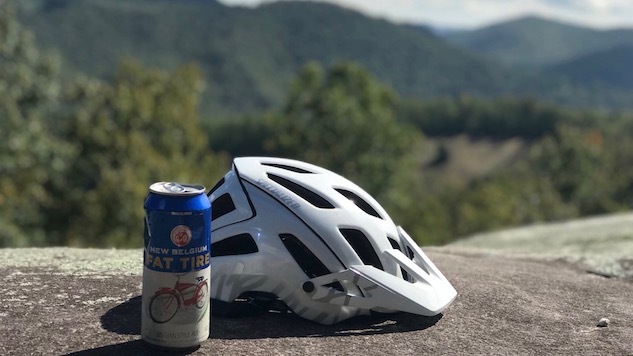 The route is 170 burly miles incorporating a mix of gravel and paved roads that take you from New Belgium’s East Coast brewery on the edge of downtown Asheville, deep into the heart of Pisgah National Forest and back again. It’s a massive, dirt and country road loop that has us carrying camping gear on our bikes and sleeping in tents at night. People embark bikepacking adventures like this all the time. Load your bike up, ride into the woods, camp and repeat. I’ve knocked out several of bikepacking adventures myself. But this is the first time I’ve ever had a beer van meet me at regular intervals throughout the ride. That’s the beauty of the New Belgium Ramble. The brewery arranges for a chef to do all of the cooking for breakfast, lunch and dinner, and a couple of really nice New Belgium employees drive the support van loaded with cold cans of beer (and Halloween candy). New Belgium sponsors four of these rides across the country throughout the warmer months (Asheville, two in Colorado and one in Ventura, California), and it’s pretty much the most fun you can have while pedaling your bike a couple of hundred miles through the mountains. Because of the aforementioned van of beer. There are 90 bikers taking part in the Asheville Ramble. It’s a mix of older road riders and younger mountain bikers, and everyone pedals at their own pace during the three-day journey. Some groups pull ahead, others lag behind but they all converge on the beer van, parked on the side of the road, every 15 miles or so. It’s a welcome site to my tired legs: a couple of lawn chairs, bucket of candy, cooler of beer and “Bonesie,” the Ramble Ride mascot. Sometimes there are peanut butter and jellies and pretzels, but mostly it’s about the beer. The route itself is stellar. You get to sample Asheville’s River Arts District, which is full of amazing graffiti, before climbing steep gravel that cuts through tunnels of green to the top of mountains with views of Pisgah’s 5,000 and 6,000-foot peaks. At one point, we hit the Blue Ridge Parkway, which is a 476-mile long ribbon of pavement connecting Shenandoah National Park with Great Smoky Mountains National Park that is known for its long-range views. This is a bucket list road if you’re into riding bikes, but the weather is moody when we top out on the Parkway, so all we get is fog and mist. But it’s okay, because I know eventually, there will be beer. I’ve ridden all of these roads before. I’ve pedaled from my house in Asheville into Pisgah and back. I’ve logged long miles on the Blue Ridge Parkway and gotten lost on country roads near the South Carolina border. This isn’t new territory for me. But I’ve never had a van full of beer waiting at the top of every major climb like a stay-at-home mom ready to hug her child every time he scrapes his knee. It’s comforting, and that beer van makes the long miles in the saddle pass with relative ease. It got me thinking that life in general would be a lot easier if there was always a van full of beer waiting for me at the intersections of humanity’s little difficulties. In the parking garage after a really boring work meeting. Around the corner from the playground during a playdate with the neighborhood kids. Down the street from my local polling center. At the end of a really long road ride, or parked in my driveway after I spend an hour trying to get my kids to brush their teeth and go to bed. Try to figure out a scenario when a van full of beer isn’t a welcome sight? I dare you. It’s impossible. Let’s play out a couple of scenarios. At the end of a long work week. After getting attacked by a shark. You see what I’m saying? Having a van full of beer pop up in your life when things get difficult is universally awesome. But it would be irresponsible for me to personally drive around a van full of beer. I have too many duties I’d have to neglect. I have kids to tote around. Soccer to coach. Groceries to get. Bikes to ride. Articles to write. I can’t spend all day driving around my own beer ban. So, what I need is an intern to drive my beer van around for me. This intern would be responsible for stocking the cooler full of beer, then anticipating my every move throughout the day. Am I coaching soccer practice? Do I have a softball game? Am I scheduled for a mountain bike ride or am I going rock climbing? The intern will need to anticipate where in my day I’ll need a beer and be there. Parked on the side of the road. Waiting, with a couple of lawn chairs, a bucket of candy, and some fresh IPAs. Or lagers, depending on my mood. The intern will need to anticipate that, too. At the end of each day on the bike during the New Belgium Ramble, the riders convene at a campground, set up their tents, then drink more beer while playing lawn games. Eventually, we settle down by a bonfire and drink even more beer and tell stories from our lives. I thoroughly enjoy that aspect of the ride too—fire-side beverages are a great way to decompress after the long hours on the bike—so the intern will need to be fire savvy too, with a full comprehension of the nuances of both the teepee and log cabin philosophies of campfire construction, and be willing to navigate various city and county fire ordinances. Also, the intern should know a bunch of ghost stories. I like ghost stories. Obviously, this will be an un-paid internship, because I can’t afford to pay someone to follow me around all day with a van full of beer. That would be crazy expensive. The beer alone would be outrageous. I should get a beer sponsor. Note to applicants: the intern must be adept in securing title sponsorships from breweries. So, no, there will be no monetary compensation for this internship. But imagine the real-world experience said intern would receive from serving me cold beer on the side of country roads and setting up campfires in random parking lots. The sky’s the limit with that sort of on-the-job training under your belt. Will an intern who follows me around with a van full of beer successfully recreate the magic of New Belgium’s Asheville Ramble Ride? Probably not. But what kind of man would I be if I didn’t at least try?